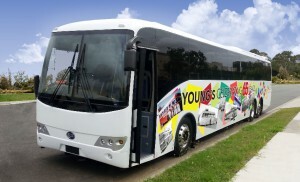 Young’s Bus Service offers an extensive range of buses for charter in and around Rockhampton and the Capricorn Coast Region. Vehicles range from 25 seat mini coach to 46, 53 and 57 seat vehicles. Catering for disabilities, not a problem, our low floor vehicles make for easy entry and have space for 2 wheelchairs. If planning a school excursion, sports day or any function for your school, Young’s Bus Service is committed to providing a safe reliable service. Please keep in mind that seat belted vehicles only allow for 2 students per seat. Allow Young’s Bus Service to transport your company / group around Rockhampton and Capricorn Coast. It is the easiest and quickest way if considering Airport transfers. Young’s Bus Service offers a range of buses to suit your private function. Whether it is weddings, birthday’s, progressive dinners – let us take you to your destination. Terms and Conditions apply for all charters and must be agreed to when requesting a quote or confirming a booking.